A 13-YEAR-OLD Tongwe school pupil, Anymore Muleya, wrestled a crocodile in its watery home and lived to tell the tale on Friday last week. 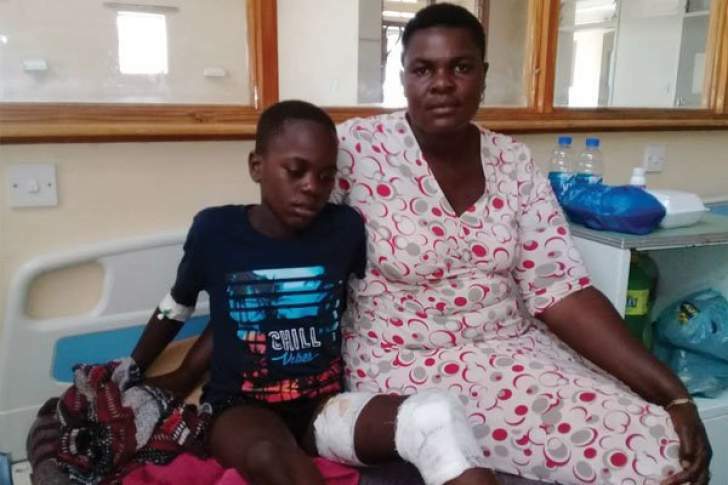 Muleya, who was hunting water ducks with his elder brother Vhulayani in Tongwe Dam, Beitbridge, sustained injuries on his left leg, but lived to fight another day. Speaking from his bed at Beitbridge District Hospital yesterday, Muleya, who is of a small stature, spoke of how he quickly plugged his fingers into the nose of the man-eater to have an advantage in the fight. "It grabbed my ankle first, but I broke free. It then went for my leg, just around the knee. I hit it with my fist and it released my knee joint and then grabbed my thigh," he said. Flanked by his mother Ndidzulapo Maseko and his grandmother, who had visited him, Anymore said as the reptile pulled him under water, he inserted his fingers into its nose, forcing it to come up for air. "I pressed deeper into its nose and it loosened its grip and came up for air. I shouted for help and my brother Vhulayani pulled me out. The crocodile let go of my leg and I let go of its nose and it fled," he said. The drama lasted about 10 minutes. Vhulayani carried his bleeding younger brother home from where he was taken to hospital. An X-ray revealed he had no fractures. Muleya said they were hunting water ducks when the crocodile attacked. "I had seen it in the distance when we entered the water and it stealthily attacked," he said. Maseko said attacks were frequent in the crocodile-infested Tongwe Dam. "Recently, more crocodiles came from upstream in the Bubye Valley Conservancy and there are regular crocodile attacks on small stocks like sheep and goats," she said.